"Thin was in" in the 1960's and Hamilton introduced a lot of "thin" models as either Thin-o-matics or Thinline manual winding models. The models featured everything from solid gold cases to stainless steel. So there was something for everyone if they wanted to be "thin". Although the Thinline line was introduced in 1958, in 1960 the model line really took off. 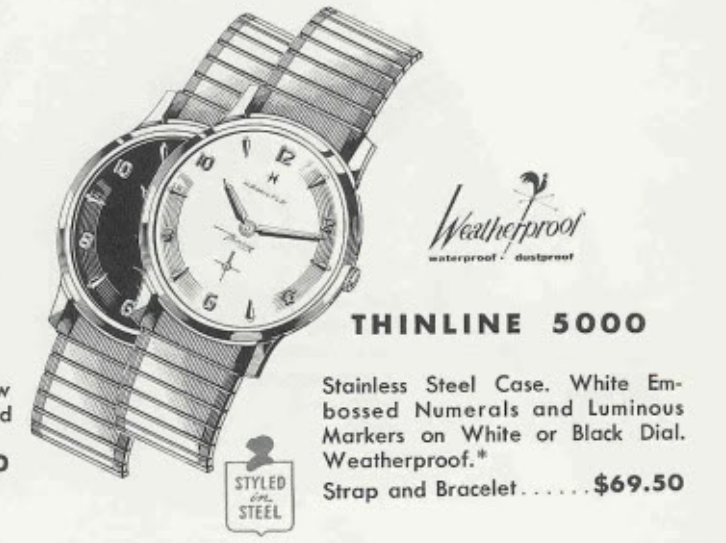 One of the 1960 models was the Thinline 5000. The model was produced for only two years and it came with your choice of a white or black dial. The Thinline models followed the same nomenclature as the various automatic models with numbering models based on the case material. The number 5 represents stainless steel and the Thinline 5000 was the first Thinline to have a stainless steel case. A lot of Thinlines used Buren movements as Hamilton eventually acquired Buren in the 1960's. But the Thinline 5000 used a Hamilton 676 movement. You don't see the 676 very often and it was made by Aurore-Villeret, a Swiss ebauche maker and part of the ESA conglomerate that owned other makers like ETA and Valjoux. Like other Swiss makers, AV movements were used in many other brands, including Breitling. I recently landed a Thinline 5000 project watch and it took me a little while to identify it because it doesn't say Thinline on it. I thought it might be a "sea something" and be one of the many sea models. It's interesting that my project watch doesn't say Thinline on the dial. Maybe this is an early model? I've seen other examples without "Thinline" though and I've 99% sure this isn't a refinished dial. My project watch was not running. I could wind and wind and wind it without every getting any resistance so I was hopeful it just needed a mainspring - in addition to a bit of cleaning. The case is a one-piece design and opens through the front by lifting off the crystal. The dial appears to be original and the finish has some bubbles or bumps on the main field. There are concentric rings around the perimeter that accentuate the embossed numerals and markers. The hands are missing some luminous paint. I'll redo them and the dial so the watch will glow in the dark again (when charged with light first). The 17 jewel 676 is filthy but it should clean up well. You can see why this is a Thinline model - check out how flat this movement is from the side. I've removed the hour wheel, cannon pinion and one of the screws from the set bridge but figured I'd take a photo to show you the dial-sode of the movement. I think this is my first 676. The backside of the movement looks familiar to other Swiss-grades in Hamilton's line up but there are a few differences too - like very tiny incabloc shock jewels on the balance. Three screws hold the barrel bridge on and with that out of the way I can get to the mainspring barrel. It's possible the arbor has just come loose of the mainspring but I suspect the spring is broken. Yup - white alloy mainsprings are sometimes called "lifetime" springs but they do occasionally break. With most of the parts cleared away you can see the AV 4201 stamped into the main plate. The AV is in a shield - typical of Swiss makers. If I wanted to order parts for this movement I could just look for parts for an AV 4201 rather than a Hamilton 676. Everything is cleaned and dried but first I need to find a mainspring. I got lucky and happened to have a new mainspring on hand. The 687 is a Buren movement and largely identical to the 676, except it has a glucydur balance. The Swiss mainsprings typically have a tang-end that catches the sidewall of the barrel as opposed to a t-end. One the shot below, the mainspring has been installed, along with the arbor and a little mainspring grease. Now I just need to pop the cover back on. All the wheels are in position and I'll but the train bridge on next. It's best to put the train bridge on first as getting four pivots to all line up is tricky if there are other parts in the way. I'll put the pallet fork on next. It's tempting to put the pallet in first but it can interfere with the escape wheel when you're positioning the train bridge. It's best to put the pallet fork in after the escape wheel is in place. Now all I need to install is the balance assembly. The movement is ticking away with good motion - it's off to the timer to listen to it's ticking. That's not too shabby. It's a little fast but I'll leave it for now as it should settle down after a while. The old crystal was crazed and beat up so I'll replace it. Since this is a Thinline, I'll try a PK style low profile crystal in 30.8mm diameter. The PK crystal was a little too thin at the dial and it allowed the dial to move slightly. I'll need a slightly thicker crystal so I'll switch to a PHD style in the same diameter. It has a slightly higher dome but it will keep the dial from rattling inside. This watch turned out pretty nice. The new crystal, fresh lume on the hands and a nice lizard strap really make the watch pop. There's not much I can do about the spotting on the dial - most people born in 1960 have a few spots too. It comes with the territory. Thanks. Out of curiosity, do yours both say Thinline on the dial?